Once upon a time goes to the movies with this trio of DVDs up for grabs. Which is your favorite? Or do you love them all? To keep things interesting, all times are Mountain. You have until 10/20 to enter to win. Good luck. The approach of Halloween means that the weather is getting cooler and it’s the perfect time of year for family movie nights on the couch at home. All of the scary movies being shown on TV aren’t exactly family friendly, so as a parent you may be finding it difficult to come up with things to watch with your little ones. Luckily for you, DreamWorks is releasing three fantastic films on DVD this month! Below, you can find out more about the characters to be watching in these family-friendly titles this Halloween. The greatest fairy tale never told comes to life as never before in DreamWorks’ Shrek The Musical, the highly acclaimed Broadway production based on the smash-hit movie. 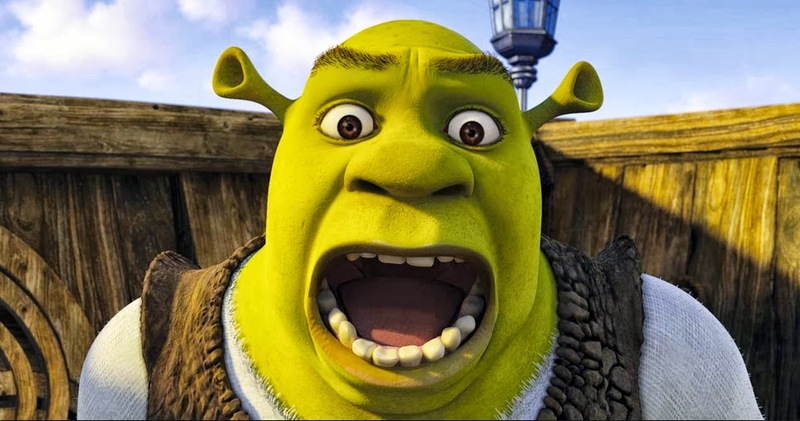 Called a “triumph of comic imagination” (Elysa Gardner, USA Today) that “never stints on spectacle or laughs” (David Rooney, Variety), Shrek The Musical received eight 2009 Tony Award® nominations including Best Musical, winning Best Costume Design of a Musical (Tim Hatley) and received a Grammy Award® nomination for Best Musical Show Album. Shrek may not want to welcome visitors to his home in the swamp, but this big green ogre would make a fun guest in your home this Halloween! Although he puts up a tough front, Shrek has a soft spot in his heart for those he cares about, especially Donkey and Fiona. This goofy guy brings the laughs with his Scottish-Irish accent and one-liners! He’s also great for scaring off enemies with his stinky breath, huge size, and frightening yell. B.O.B., short for Benzoate Ostylezene Bicarbonate, got his name when he was accidentally created in a laboratory from some scientists experimenting with chemically- and genetically-altered food products. 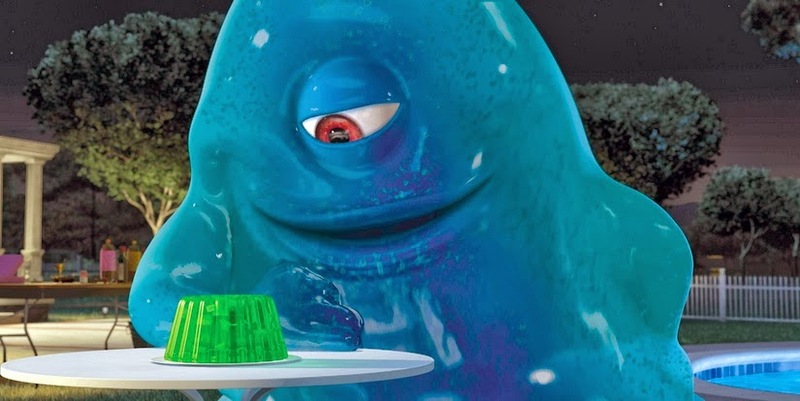 This one-eyed blue blob was held in captivity in Area Fifty-Something for decades, but he still has a friendly personality and contagious smile. Since B.O.B is a large gelatinous mass, he can change his shape easily and absorb any object. Although he has no brain, B.O.B. is quite intelligent! This big, blue blob is exactly the person you want by your side on a creepy Halloween night. 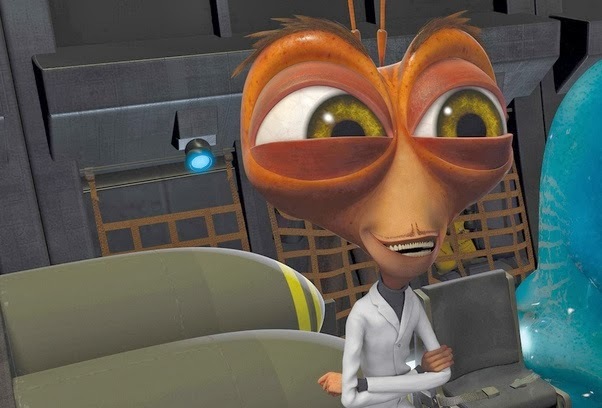 An intellectual mad scientist, Dr. Cockroach, Ph.D. is known for bursting into psychotic laughter while completing his experiments. But, don’t be fooled. Dr. Cockroach has not always been this way. In the 60’s he developed a device that would allow humans to live a lifespan similar to that of a cockroach. When his creation went wrong, Dr. Cockroach came away with the head of a bug and the ability to climb walls and digest garbage just like cockroaches. His intelligence and lifespan make him a force to be reckoned with! 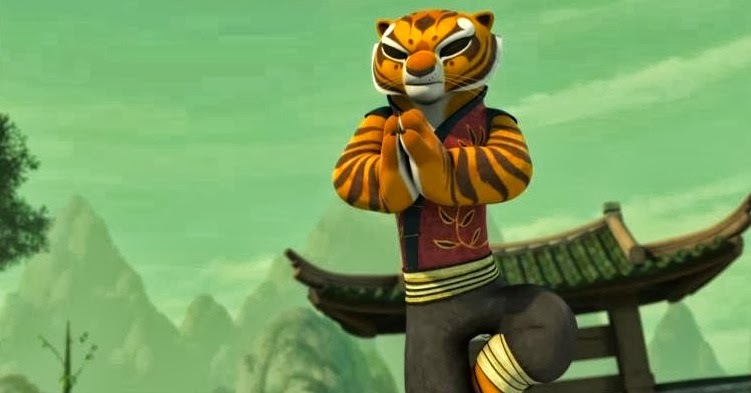 Get ready for more high-kicking action and fur-flying fun in this awesome animated TV series based on the Academy Award®-Nominated hit movieKung Fu Panda*! He may not be your typical warrior, but Po packs an arsenal of martial arts skills as big as his heart...and his stomach. Always ready to fight for what’s right, Po and the Furious Five—Tigress, Monkey, Mantis, Crane and Viper—face exotic dangers at every turn, including a pair of magic shoes with an evil “sole,” and Scorpion, one of the sharpest villains in all the land! The courageous dragon warrior, Po Ping, is always up for a new adventure. 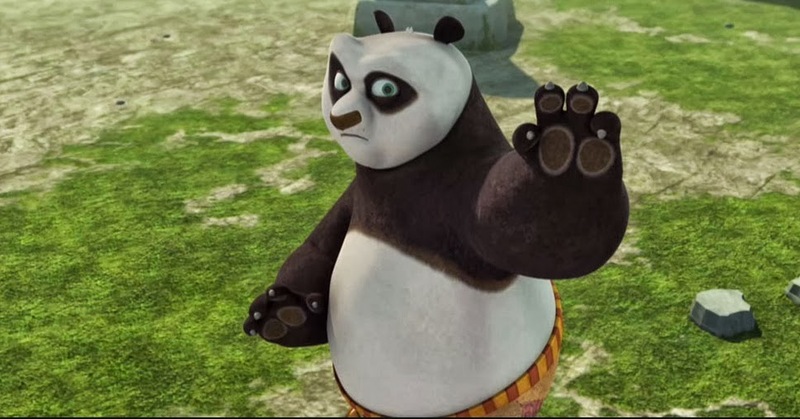 Although Po is not your typical Kung Fu warrior, he uses his personality and his strengths to solve problems and protect those who need him most. He has an excitement for life and is determined to be the best warrior that he can possibly be. Sometime Po can be a little immature and rambunctious, but he has a kind heart and knows the importance of family. 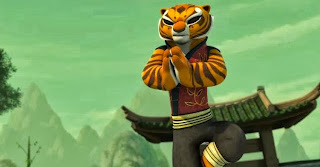 A vital member to the Furious Five, Tigress has unmatchable strength and bravery. She is a master at Kung Fu and at one point was considered to be destined for the title of Dragon Warrior. Although her short temper can still appear sometimes, Tigress has learned to be more friendly and calm. At times she is quiet and less sociable than the other members of the Furious Five. Overall, she possesses a strength and dignity that makes others admire her. To celebrate these fun movies being released, and Halloween in general, we have some fun activity sheets, cards, and masks you can download HERE. In addition to these fun printables, we have a wonderful giveaway to share with you thanks to Love, Juliebug being part of the Fox Home Entertainment Insiders. 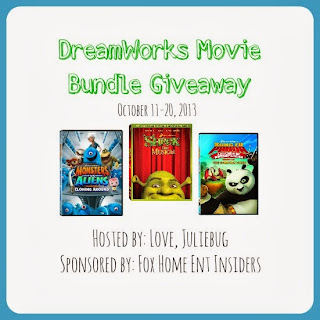 One reader will win a bundle of three movies; 1 copy of Monsters vs. Aliens: Cloning Around on DVD, 1 copy of Kung Fu Panda: The Scorpion Sting on DVD, 1 copy of Shrek the Musical on Blu-ray. The giveaway runs until 10/20 at 11:59 pm Mountain Time. 18+ US only. I want to win this bundle for my daughter. Thanks for the giveaway! I would love to win this bundle for my kids and husband they would love it! I would like to win this for my niece and nephew. I'd like to win this for my whole family. I want to win these for my two sons and neice. I'd like to win this for my precious little nephew, who needs new videos to watch! I want to win this for my niece and nephew.